Catches come in all shapes and sizes to suit a variety of different applications. We explain the most common types of catches used around the house below. The Bales catch (sometimes referred to as just 'a ball catch'), has a spring loaded ball held within a cylinder attached to a flange. The catch is recessed into the edge of the door while the striker plate is recessed into the jamb. The roller catch is similar to the Bales catch except that a roller is used instead of a ball. The roller normally has a slot in it which allows adjustment of how far the roller protrudes from the flange. Some plastic models have an adjust at the back of the cylinder, so the roller assembly needs to be removed from the door for adjustment. The roller fitting and sticker plate are recessed into the door and jamb respectively. A sprung roller consists of a roller assembly with two rollers which open up as the clip is pushed into it as the door is closed. The roller assembly is fitted to the side of the cupboard while the striker plate is fitted to the back of the door so that the two parts line up. The body of the roller assembly normally has slotted fixing holes to allow small adjustment so that the clip is firmly held by the rollers. 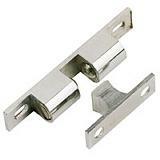 The magnet catch consists of a moulding holding the magnet and a metal striker plate. The moulding is fitted to the side of the cupboard while the striker plate is fitted to the back of the door so that the two parts line up. 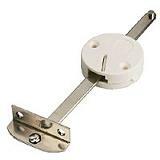 The moulding holding the magnet normally has slotted fixing holes to allow small adjustment. A double ball catch has two balls in a casing which hold the striker inplace when it is inserted between them. The balls can often be adjusted (by a screw behind each) to increase the pressure applied to the sticker plate. Both the striker plate and the casting normally have slotted fixing holes so that both can be adjusted to line up. 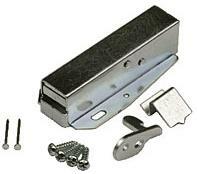 The touch latch works on a 'push once to latch, push another time to release. The main body is fitted to the inner side of the cupboard and the striker plate (or more accurately, the catch) is fitted to the inside of the door to line up with the catch. The lift-up stay is used to support a lift up cupboard in the open position for easy access. The normally work on a lift to engage and then lit to release principle. The bracket end fits to the door, and the circular body of the latching mechanism fits to the inner side of the cupboard. Attention needs to be paid to the position of the catch to ensure that the cupboard can be opened far enough. Unlike the other catches on this page, which all fit behind the door and work without special attention, the turn handle catch fits to the front of the door and works by 'twisting and pulling'.